I might be the only unmated female in my tribe, but it doesn't mean I've given my heart. I'm waiting. I want resonance, and I won't settle for anything less. But when an alien ship lands and a handsome stranger steps out, I know he's the one. His name's Mardok, and he's fascinatingly different - and distractingly appealing. But Mardok can't stay on the ice planet, and he says he can take me with him. I adore Farli, her innocence, kindness and chompy lol I'm glad Mardok decided to stay. 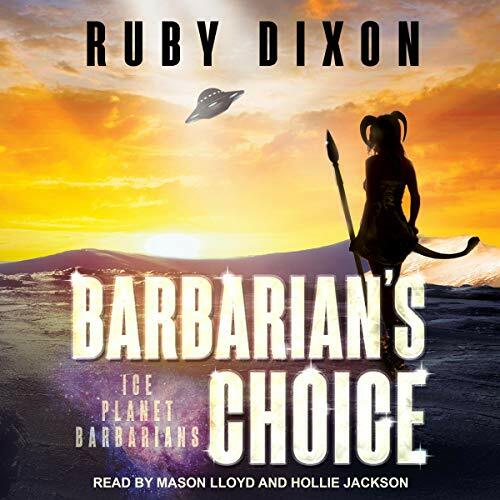 Hollie Jackson and Mason Lloyd you guys are legends thanks for bringing our favourite Barbarian's and their resonance to life. A sweetheart story. Definitely a PG-13, for our Barbarian tribe. I love that we were brought up to current thoughts of who,how and when the Sa arrived on the planet. And the peppering of clues to the Ice Home series. Thank you Ms Dixon for these wonderful characters. Ms Jackson for our women not sounding like a 12 year old girls and Mr. Lloyd your portrayal of the Sa men is awesome. You bring them to life. too short For sweet Farly, the relation that Ruby creates with new Characters it shows her Master mind . This series is highly recommended.